Studying physics & astronomy or engineering physics? Please contact Matthieu Boone (matthieu.boone@ugent.be) if you're interested in a master thesis within the Radiation Physics research group. The subjects below are indicative for the year 2019-2020. We can offer a broad range of master thesis topics, ranging from experimental and hands-on to software-oriented. We encourage you to contact us for a personal conversation, in which we can discuss the possibilities and tailor a topic to your needs and expectations. You can view the thesis topics in poster format: part 1 and part 2. No thesis subject has an obligatory internship or mobility, but there are some possibilities for those that we can discuss, possibly in collaboration with our spin-off TESCAN-XRE. At very high resolutions, X-ray refraction or phase contrast becomes visible along with the traditional contrast due to X-ray attenuation. Although this effect yields a clear visual contrast (by edge-enhancement), it gives rise to unrealistic reconstructions of the 3D volume, which is highly undesirable in quantitative analysis. For highly coherent sources such as synchrotron sources and Inverse Compton Scattering sources such as the Smart*Light source, it is of high importance to correct for and even exploit this effect. However, the processing of the images and extraction of the refractive index is far from trivial, as the measured image is a mixed phase-and-amplitude image, containing both signals simultaneously. A potential topic is to investigate the potential of iterative reconstruction algorithms for improving the reconstruction of both the phase and the amplitude signal. Within these topics, experimental validation is of key importance. In typical X-ray detector systems, the X-ray energy of all interacting photons is integrated, hence all spectral information is lost. The RP group has access to a novel energy-dispersive full-field detector, of which only a few systems exist worldwide. This detector records a series of 1000 2D images at different energies simultaneously, at an extraordinary energy resolution, allowing to retrieve chemical information from the dataset. To record this spectrum, single frames are acquired very rapidly (at 400Hz), in which single charge clusters generated in the sensor by a single X-ray photon are observed. These charge clusters are analyzed to reconstruct the location of incidence and total energy of the photon. As the creation of these charge clusters is a statistical process, they often overlap, deteriorating the reconstruction. Potential topics in this field are 1) to improve the analysis of the raw data (the clusters), e.g. using neural networks, allowing for an improved efficiency and reliability of the detector, or 2) to develop methods to exploit this 4th dimension in tomographic reconstruction. 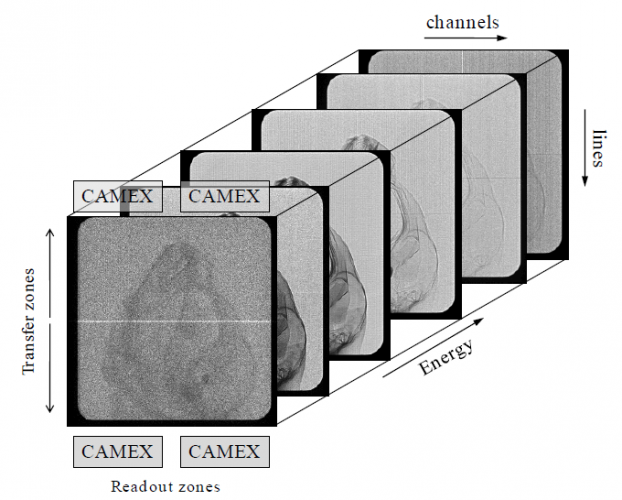 Conventional X-ray (micro-)CT allows to determine the morphology of an object non-destructively and in 3D, yet does not yield direct chemical information. X-ray fluorescence on the other hand is able to retrieve the local chemical composition of an object. Recently, a novel and unique instrument (Herakles) combining both techniques was built in a close collaboration between the Radiation Physics group and the X-ray Microspectroscopy and Imaging group which is now operational. 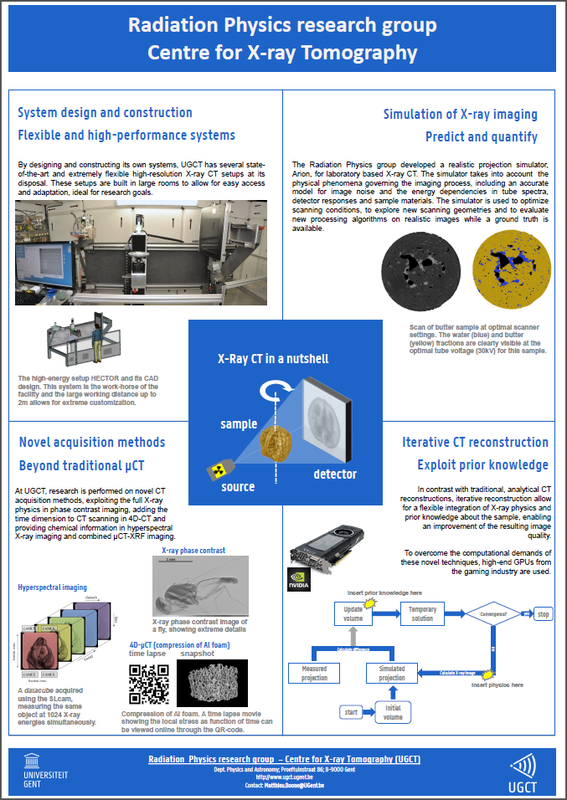 Potential thesis topics range from the optimization of acquisition protocols on this novel system to the implementation of self-attenuation correction in XRF-CT reconstruction. In tomography, a number of radiographic projection images are acquired while the sample is rotated relative to the CT system. To obtain a 3D volume, CT reconstruction algorithms use this information to calculate a discrete representation of the volume. Compared to conventional analytical reconstruction techniques, iterative reconstruction algorithms allow for more optimization, e.g. taking the motion of the sample into account. Due to their computational complexity, they are programmed on Graphical Processing Units. 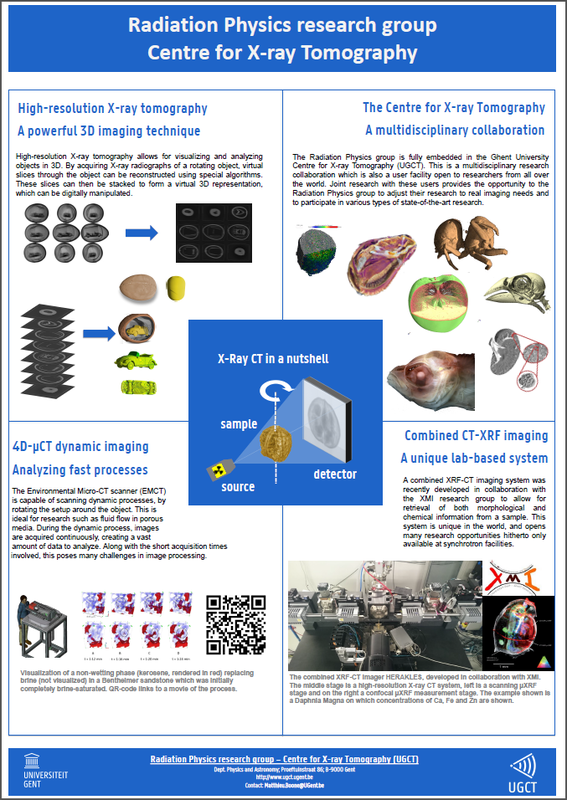 In these topics, iterative CT reconstruction algorithms are adapted for specific acquisition methods, such as dynamic CT (4D-µCT), hyperspectral imaging, XRF-CT imaging, etc. The study of flow in porous materials, such as rocks and soils, has a wide range of applications in geological engineering and environmental sciences. This includes geological carbon capture and storage (i.e. storage of CO2 in rocks), ground water remediation (e.g. study of the mobilization of pollutants) or the development of building materials (e.g. study of water and salt transport). 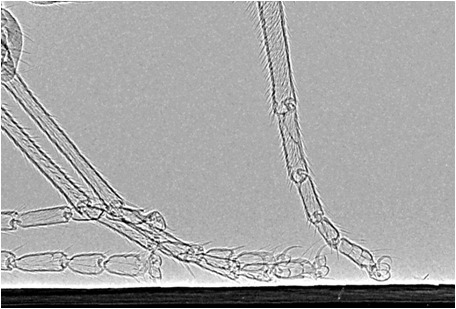 UGCT develops and uses 4D micro-CT scanning techniques that allow to "film" fluids inside the pores during flow experiments. 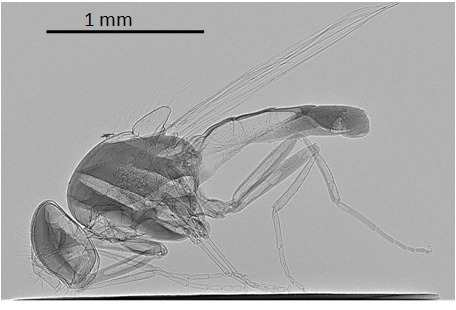 Such scans result in 4D image data sets consisting of tens of gigabytes per experiment. While the data is very rich in information, extracting useful insights in an efficient and feasible way is an open problem. 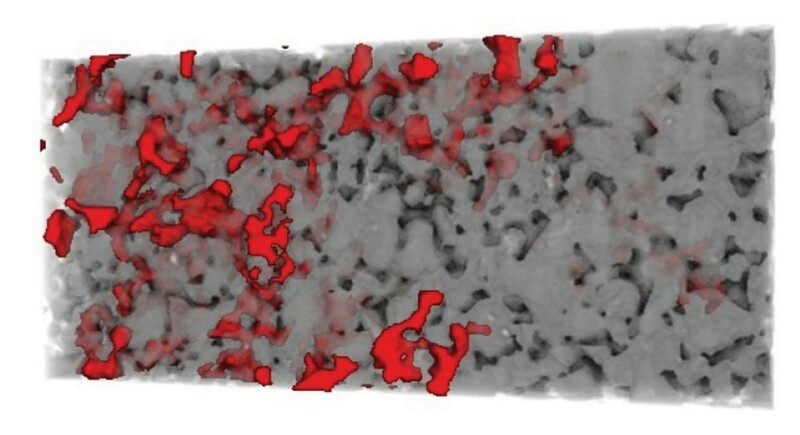 Potential topics in this area include: 4D image analysis (machine-learning based image segmentation, measuring fluid interface movements) and simulating fluid flow in pore structures extracted from micro-CT.